Hair loss is an embarrassing topic and women make up to forty percent of hair loss sufferers. Commonly mistaken as a “male only” issue, hair loss is often more emotionally stressful for a female. Now there is an “instant makeup for your hair loss” from SureThik. 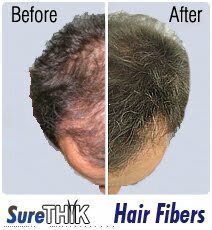 SureThik Hair Thickening Fibers – a new, all natural product that thickens the appearance of hair with hair building fibers. - SureThik hair building fibers are completely natural, keratin protein fibers. - The organic keratin hair building fibers used in the SureThik formula are the same as the keratin protein that makes up human hair. - SureThik provides instant results and can be used daily. - The hair thickening fibers bond to the existing hairs on your head to create a fuller, thicker look. - The difference in density and volume can be seen as soon as the product is applied and won't move until you shampoo your hair, even in wind and rain. Gerry's hair is thinning on the crown. We tried out the Sure Thik dark brown hair thickening fibers on his crown.It was amazing what it did.It shakes out of a little container, much like a salt and pepper shaker, shaking out fine fibers of what looks like fine hair. It sticks to your hair and actually thickens hair, covering up any thinning spots. This would be a perfect product for women as well, who have thinning hair. Sure Thik is available in 8 colors and an economy size SureThik Hair Fibers are every bit as effective as their regular size unit, but is more convenient for those who travel or are on a budget.The 10 Gram bottle will last for 20 days with daily use and costs only $19.95. Sure Thik would love to give away a container in the color of your choice to one lucky winner from Canada or the USA. A random draw will be held by Random.org on April 22,2011 from all entries recieved. Is thinning hair a problem for you? yes,thinning hair is becoming a problem for me. Ive always been the unfortunate one with thin hair and I notice to be getting thinner more and more. I wonder if this stuff even works. Yay!! Thanks Monique I sent an email. Hope you get it!